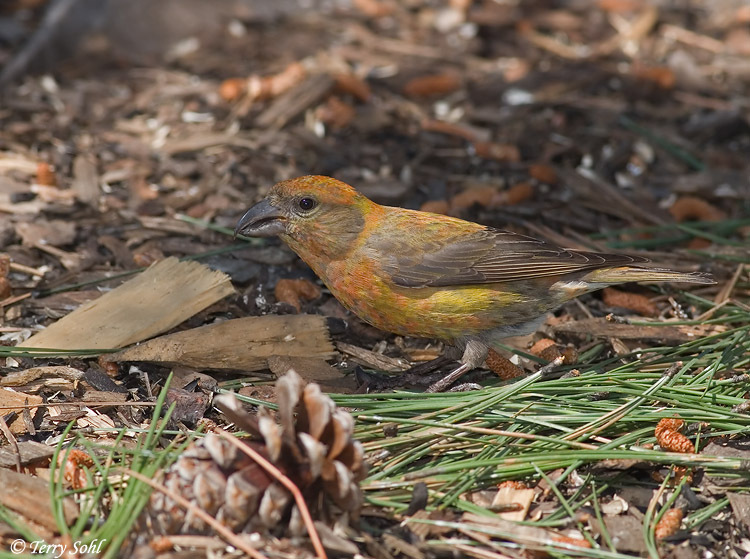 The Red Crossbill is primarily a denizen of conifer forests due to its strong preference for conifer seeds. 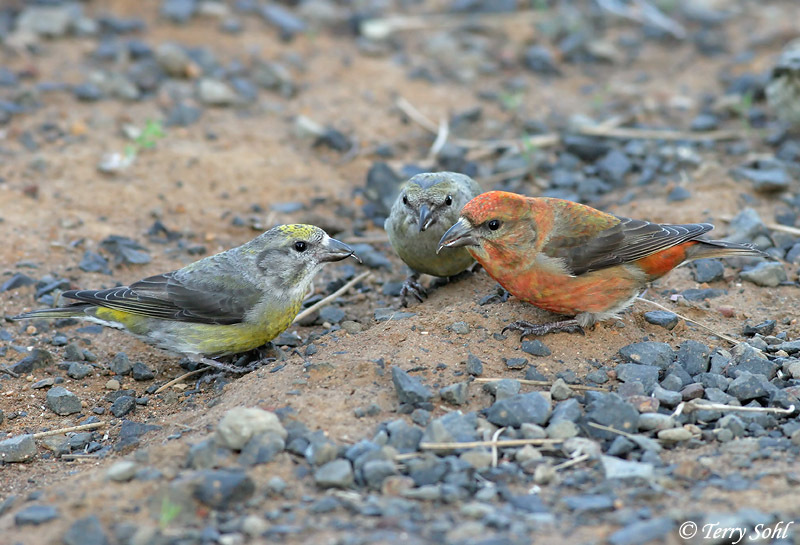 However, flocks can be highly nomadic, especially in winter. 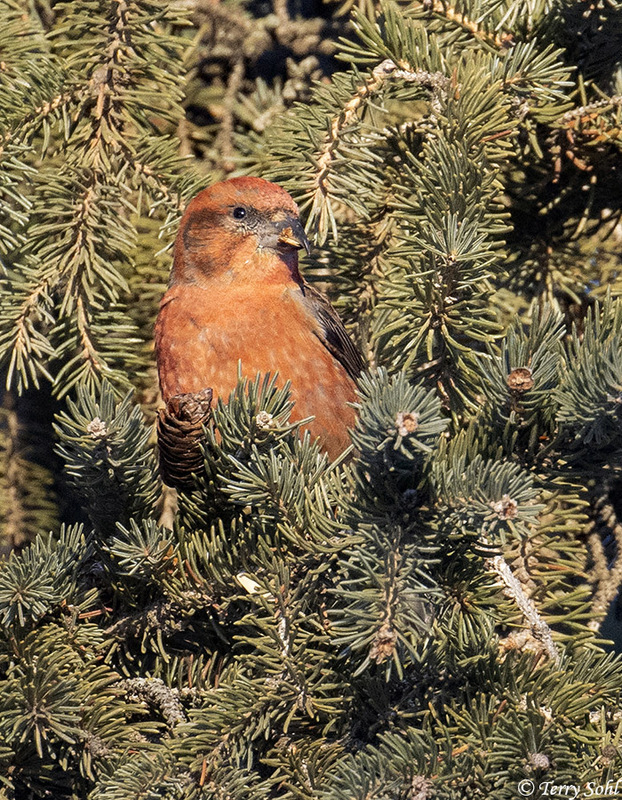 While normally frequenting the northern U.S., higher elevations of the western U.S., and Canada, individual flocks may disperse widely in the winter, moving long distances to the south, east, and towards lower elevations. They have odd nesting habits, and will nest in nearly any season if sufficient food items are available. A male is depicted in the photo on the right. 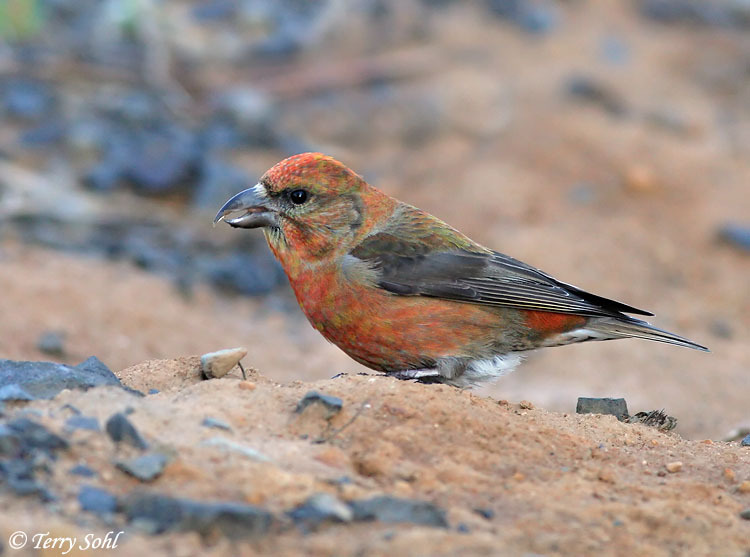 More photos of both males and females can be found on the bottom of the page. 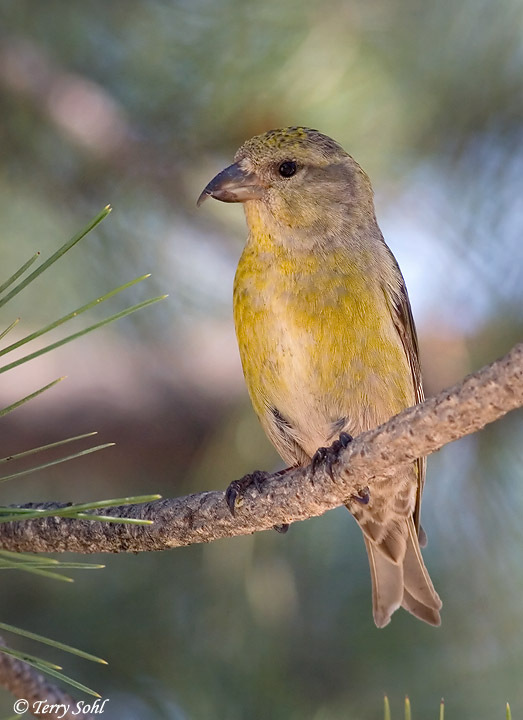 Habitat: They are rarely found long distances from conifer trees. 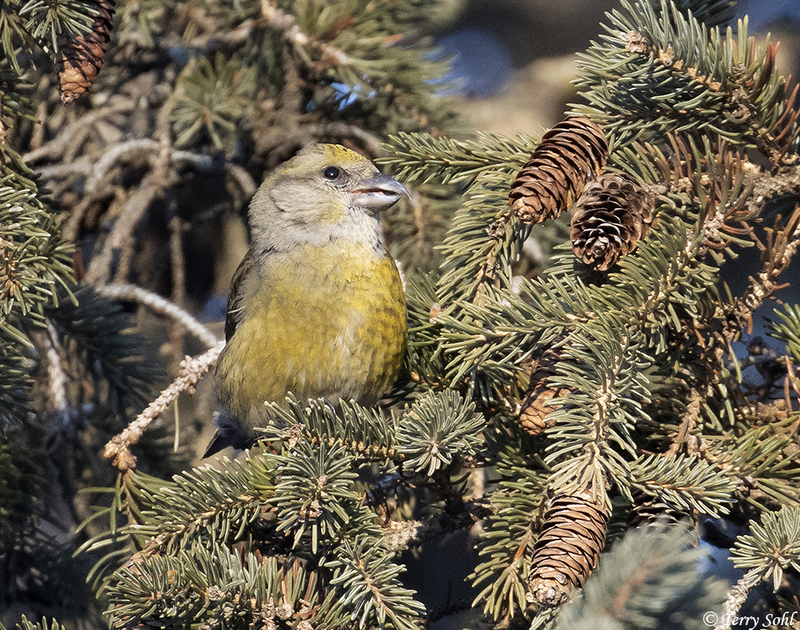 Nomadic flocks may appear in suburban areas in winter, however, frequenting feeders. 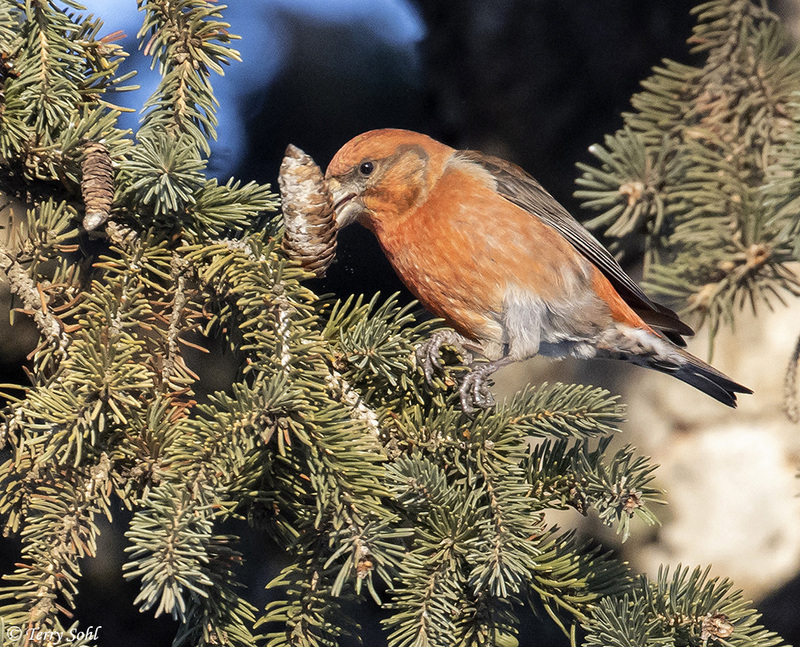 Diet: Primarily feeds on the seeds of conifers. Will also eat other seeds, tree buds, berries, and occasionally insects. 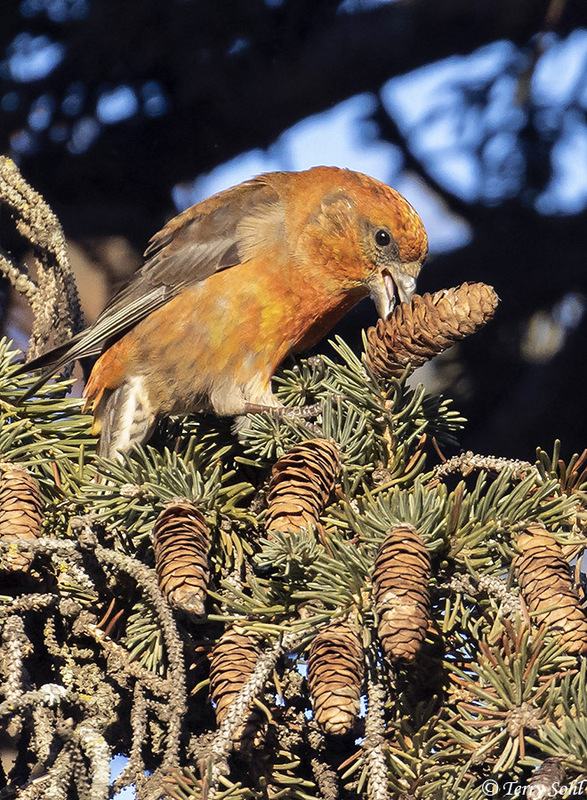 Behavior: Usually forages in flocks in the foliage of conifers, climbing over cones and extracting seeds. Nesting: Highly irregular nesting, with dates often timed to concur with best availability of cone crops. 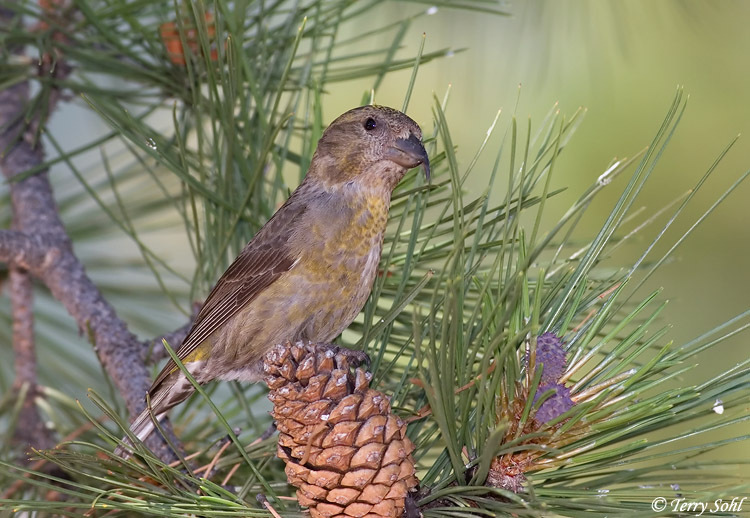 Has been known to breed in almost any season. Song: Song is a series of short phrases with interspersed call notes. 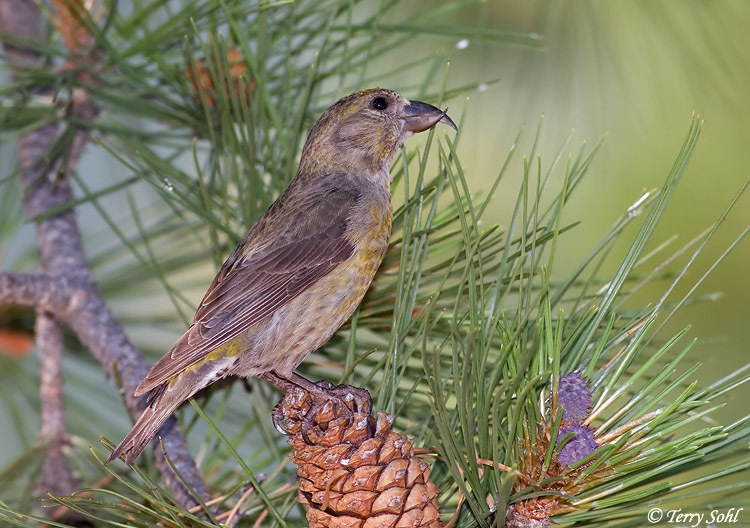 Song depends upon race/sub-species, with distinct songs for each of 9 possible sub-species. Migration: Generally a semi-permanent resident in much of its range. 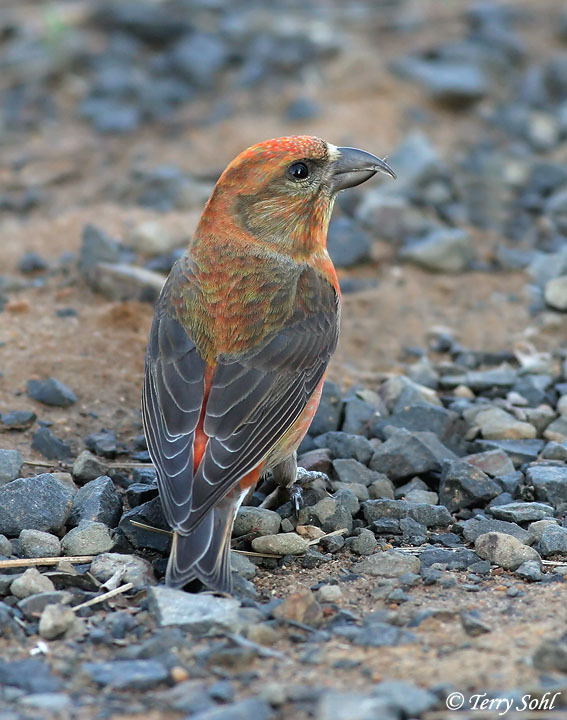 However, individual groups can be highly nomadic, and long distance dispersion the the south, east, and into lowland areas can occur in the winter. Only commonly seen outside the Black Hills during the winter. 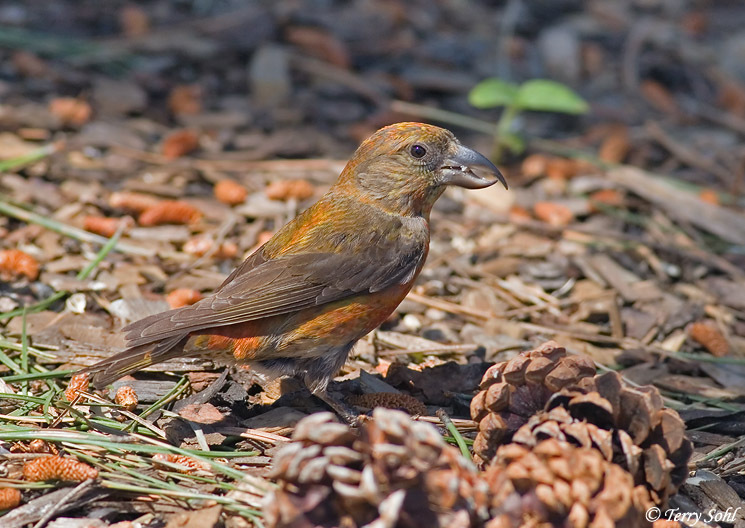 Bird Feeders: Will attend feeders for sunflower seeds, occasionally for other seeds. Conservation Status: Generally stable throughout their normal range. 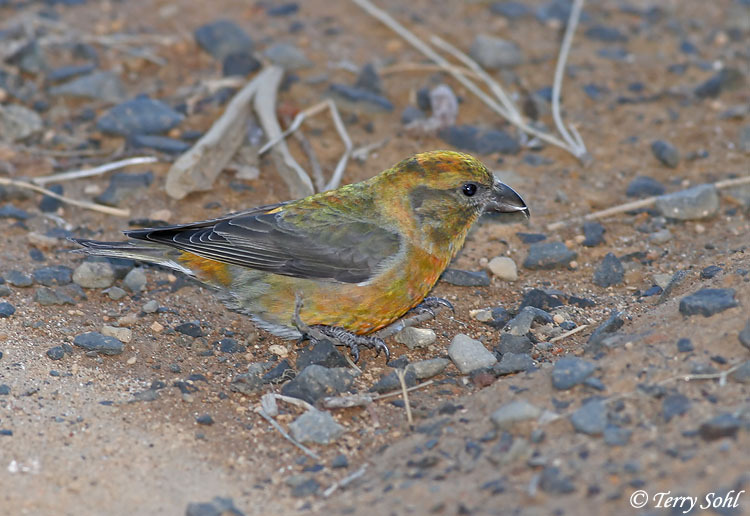 Additional Photos: Click on the image chips or text links below for additional, higher-resolution Red Crossbill photos. South Dakota Status: Common permanent resident in the Black Hills. 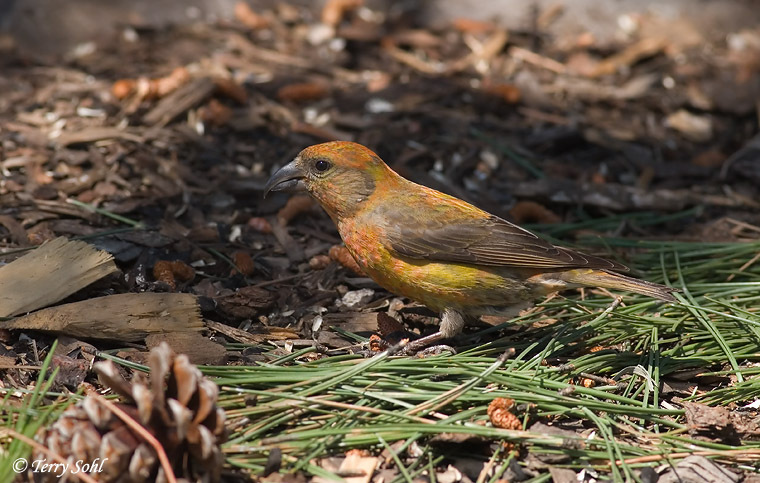 Uncommon migrant and breeder elsewhere in the western part of the state. 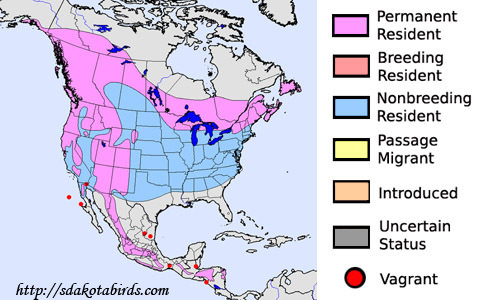 Irregular but sometimes common winter visitor in the north, irregular and uncommon to rare in the southeast part of the state.